This time the occasion is unique, because our wine meeting is exactly on Fat Tuesday. 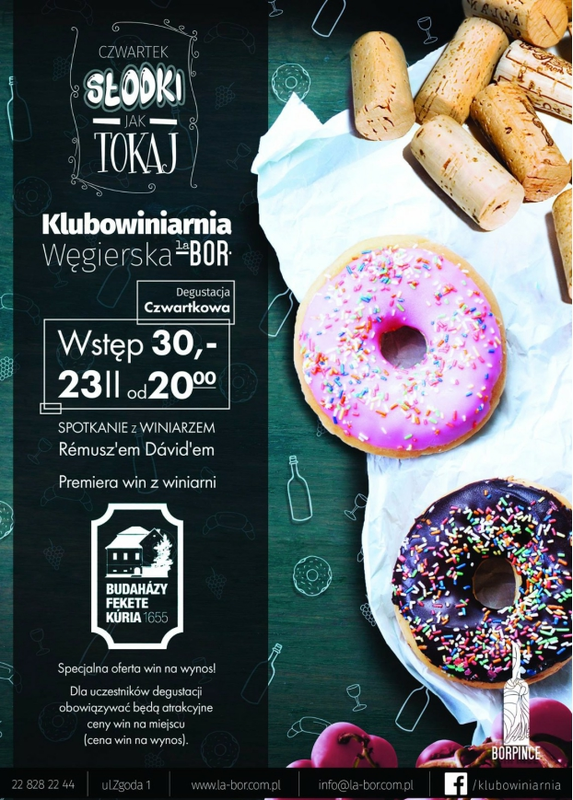 On this occasion we have prepared something special: Polish premiere of wines from wineries Budahazy Fekete Kuria, straight from Tokaj! This place and these wines are our last discovery. We wanted to share it with our guests as soon as possible. We have this opportunity to invite also the creator of these extraordinary wines, Mr. David Rémusz'a. So it is another unique opportunity to talk with the winemaker during our tasting on Thursday. We will prepare also the donuts and other sweets especially for this day! The event starts on Thursday, 23rd Feb at 8 p.m.
INTRODUCTION: 30 PLN / persons.